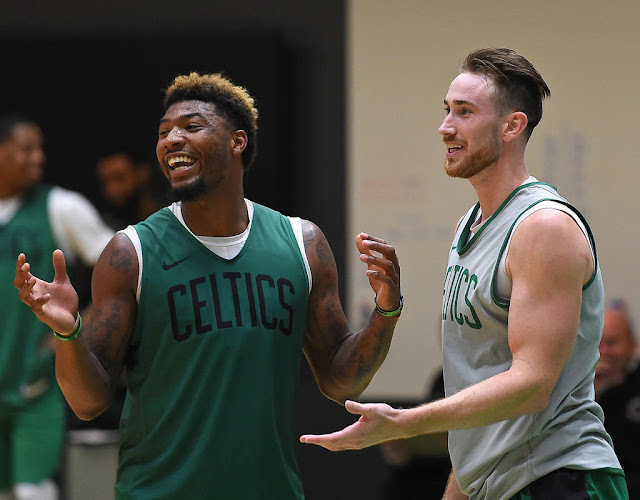 Marcus Smart doesn't just disrupt opponents' offensive sets - he irritates the hell out of his teammates, particularly one that needed a bit of prodding. Gordon Hayward needed to become a little more aggressive on the court, so Marcus decided to get Gordon on track during practice. The Celtics were embroiled in one of their toughest practices of the season, and they were poking and prodding at Hayward -- "fouling him and s---" as Marcus Morris put it. "He just got red at one point," Morris said. "He was really upset. He was going really hard." The catalyst (predictably) was Marcus Smart, according to Morris. The Celtics' chief instigator got tangled up with Hayward, and Hayward was quietly boiling. The results were eye-opening. Brad Stevens said the practice let him know Hayward had a big performance was coming. Kyrie Irving said he knew Hayward had "that ticker inside him." Morris said Hayward started getting out in transition and dunking in ways the Celtics had yet to see since he joined the team. 🔘 only the third player in NBA history to get that in 30 minutes of less. In a matter of a week or two Hayward has transformed himself from what many called a total disappointment to a very-likely piece that yields the first NBA Championship for the Celtics since 2008. There is nothing that Gordon doesn't do well. The Minnesota game was the third best of his career, and he still is not back 100-percent from his injury. All it took was a pep talk from Kyrie Irving and an injection of Cobra-venom from Marcus Smart. Hayward may be heading for a career year.